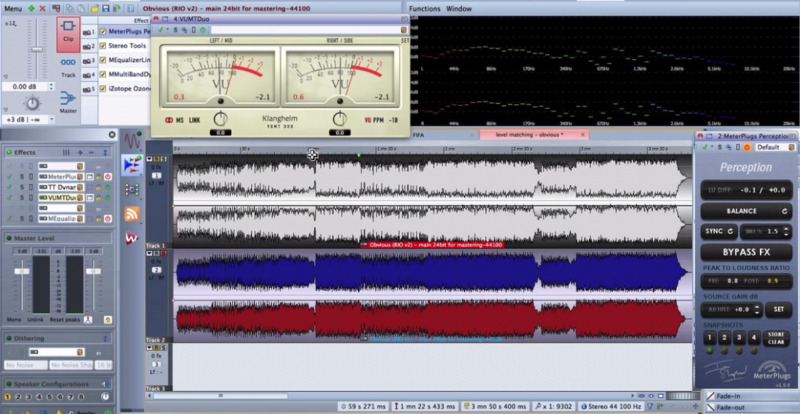 Last week, I shared an amazing blog article about home studio mastering with you. Special thanks to Ian Shepherd for sharing his knowledge with us! Referencing. – Comparing your mixes and masters professional releases, that you know will sound great on multiple systems. This technique can help you to overcome any shortcomings in your monitoring system and help you to get your mixes to translate well across different playback systems. But there is one crucial step when referencing professional masters: Without it, your ears can trick you when comparing your master to a professional one and you won´t be able to draw the right conclusions from your comparison. This technique is easy to implement, but it has a huge impact in helping you to make the right decisions. What is it? You´re about to find out! I hope you´ve enjoyed the video and it´s helping you to make the right decisions when comparing your mixes and masters in the future. By the way: Also apply this technique when mixing. Make sure your plugins are level-matched from one plugin to the next, so you´ll be able to judge your mixing decisions accurately. Ian is launching his Home Mastering Masterclass today. This masterclass is an in-depth 8 week program, in which Ian will teach you all the techniques and principles you need to know to make your masters stand up to professional releases. We´ve been able to work out special deal for you: As a follower of Produce Like A Pro, you´ll get a £50 on the Home Mastering Masterclass. Please use the code: “PLAP50“ to get an instant £50 discount. Ian has been a professional mastering engineer for over 20 years and has become a leading expert in teaching mixers and aspiring mastering engineers how to master from their home studios. Using The Tools Already At Your Disposal! This masterclass is especially designed to help home studio owners to master their own mixes and songs. The course is based around mastering with plugins and doesn´t require the use of any expansive analogue gear. – You´ll learn how to get a great masters only using the tools at your disposal. In each of these 8 tutorials, he´ll explain which techniques he uses, how to apply them, but most importantly the WHY behind his decisions. By understanding the reasoning and underlying principles of mastering, you´ll be able to apply the techniques taught in this course in any DAW or with any set of quality plugins. Ian features a wide variety of plugins in these courses, to learn more click here. Understand the 3 fundamental mastering techniques: EQ, Compression and Limiting. – And learn how to use them effectively. Master advanced techniques like Mid-side Processing, Parallel compression, Mutliband Compression, Stem Mastering and more. – How to set up acoustic treatment in your studio and monitoring properly. – Loudness: How loud is loud should you master your songs. Everyone´s situation is different and Ian wants to help you to get to your desired end-results personally. That´s why he´s offering live Q&A webinars and a private facebook group, where you can connect, ask any questions you have about the tutorials or problems you encounter when mastering in your home studio. The facebook group is highly interactive and Ian is really hands on with this students. – So don´t miss this opportunity to get first hand advice from an experienced mastering engineer! Ian has gotten a lot of great feedback from the people who took this course, so he´s convinced it will help YOU to take your skills to the next level as well. That´s why he´s offering a 30 day money-back guarantee: If for any reason you´re not happy with the course or your don´t feel like it´s beneficial to you, you´ll get a full refund – no questions asked. – and the videos are yours to keep! Join The Home Mastering Masterclass! Please use the code: “PLAP50” to get an instant £50 discount.